For thousands of years, European forests and grasslands were inhabited by majestic animals – aurochs, large wild cattle with dark coat and large horns. Due to overhunting, they are now extinct. The last aurochs died in Poland in 1627. Now the Aurochs is coming back to European nature. Taurus Foundation (Stichting Taurus) is a Dutch organization that uses feral cattle in nature management and natural grazing schemes. “In our choice for certain cattle breeds, we want to use the hardiest breeds and the breeds which best serve their ecological role. Therefore we want to use breeds that are as authentic as possible,” says Henri Kerkdijk-Otten, the project manager of Project Tauros. To investigate this, Project Tauros did proceed by examining old and authentic European cattle breeds on known aurochs characteristics. The first outcome was that the experts from Project Tauros identified some authentic and also very threatened cattle breeds. The next big step they had to take was to involve a broad spectrum of relevant sciences: geneticists, archaeozoologists, cattle experts, aurochs experts, ecologists, historians, archaeologists, biologists, etcetera. “Our goal is not to create a showroom model of the aurochs, but a breed of cattle that in appearance, vegetation use, behavior and also genetically resembles the aurochs as closely as possible. For this reason, we look at it from a multi-disciplinary perspective,” says Henri Kerkdijk-Otten. The breeding program started in 2009 and the first results are very promising. Wageningen University, in cooperation with the European Cattle Genetic Diversity Consortium, is researching ancient aurochs DNA and compare that with DNA of European cattle breeds. Based on that, they are assisting Project Tauros experts in setting up a breeding program and a monitoring program. Archaeological depots, natural history museums and scientists from a variety of European countries have donated aurochs material and DNA material of cattle breeds to be used for this research. Besides that, scientific studies are carried out in other European countries on different aspects of the project. Aurochs bone isotopes are being studied to retrieve information on the diet and vegetation use. The cattle breeds used in the Project Tauros breeding program are being studied regarding their vegetation use, natural behavior and other characteristics. Within the European Cattle Genetic Diversity Consortium, investigations are carried out on possible aurochs introgression in domesticated livestock. These are just a few examples of the researches that are carried out under the umbrella of Project Tauros. 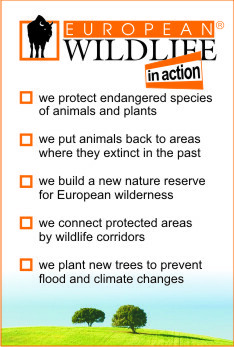 The project is now going to do the sole ‘supplier’ of ‘aurochs’ for the rewilding project of the Wild Europe Initiative. “In a very short while, we will get the first results of the genetic studies. We are currently setting up facilities to speed up the breeding program,” continues Henri Kerkdijk-Otten. There has already been a project that focused on rebreeding the Aurochs – in the interwar period in Germany. In 1920, two German biologists – the so called Heck brothers – attempted to recreate the Aurochs. But the Heck Cattle is not very simillar to the original Aurochs and its bulls are very aggressive to humans due to the fact that Spanish fighting cattle was used in the breeding program. That is the reason why Project Tauros started a breeding project again. “There is just one thing we can not compromise on when constructing a cattle breed; behavior towards visitors. We cannot forget that virtually all the nature reserves in Europe are visited by people who wish to enjoy nature. However, this does not have to be a problem. From what we know from the last historical sources on the Aurochs, they were not aggressive towards humans. In general, big wild herbivores are not aggressive towards humans and they tend to avoid conflicts,” emphasized Henri Kerkdijk-Otten. European Wildlife conservation organization is now preparing its project of reintroduction of European Bisons in Central Europe. When the population of the European Bison adapts, the organization will consider releasing other large herbivores in the wild, including backbred aurochsen from Project Tauros.